Reading Carolyn See, I’m sixteen again, flying with my girlfriends up Pacific Coast Highway. We are good students, serious girls, honors English, we have standards, but on Fridays after school, we are free. Bouncing along in a finned Ford or Buick, blasting our music, shouting into the salty wind to anyone who will listen, happy to be cruising to the outer limits of vast LA. Carolyn was like that. She captured all the broken dreams and sun-baked inhabitants of an indefinable city without driving off the edge, without abandoning the zany sense that all this is nuts, but aren’t we having a great time? Her writing in all its forms – novels, memoir, book reviews – always grasped the importance of a subject, but without a pompous PhD voice. No dusty academia for her, even though she graced the halls of respected universities. Even writing about sadness and terror – her screwed-up parents, lives, loves and worlds lost – she managed to reveal all through a lens of compassion and humor. I knew none of this in 1980 when I went to interview her. I didn’t know who she was. I read about her novel “Mothers, Daughters” and decided it would make a nice story for Mother’s Day. 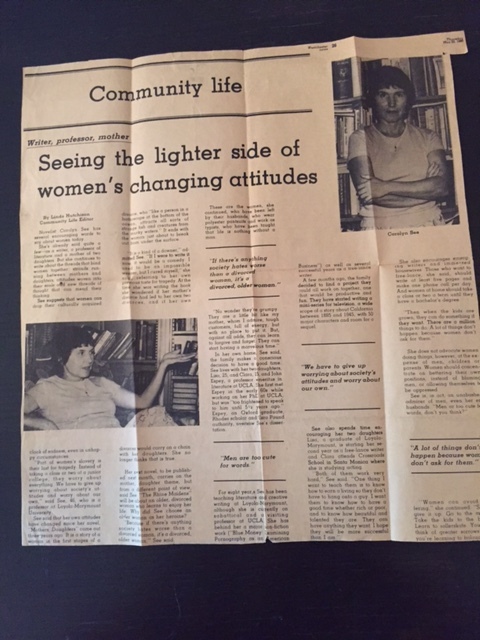 As the new feature editor of the Culver City News, it was my job to build up the Community Life section of the paper. And so I did, little reporter notebook in hand, camera in my purse. She greeted me warmly and escorted me into her office with high windows. Unlike many people being interviewed, she seemed at ease. I liked her lack of pretention. “If I were to write it today, it would be a comedy,” said Carolyn. After jotting down all I could capture, I took Carolyn’s picture, assumed I’d be leaving. And so I met her distinguished man friend John Espey and her daughter Lisa See and my story took on more layers and flavors. An anthropology professor sat with us for awhile. Carolyn announced she was anxious to get home to see how the wetbacks she hired to work in her yard were doing. “Carolyn!” the professor admonished her. But I think she knew Carolyn spoke from irreverently dark humor, not meanness. I learned that Carolyn had first met John in the early 1960s. An Oxford graduate, writer and UCLA English professor 21 years her senior, he oversaw her dissertation. “But I was too frightened to speak to him until 5 ½ years ago,” she admitted. They were together for more than 25 years. I enjoyed writing the story and Carolyn liked it too. She and her daughter thought it was horrible I was stuck in an office and had to write for others. I often thought of Carolyn in the years that followed, especially after I moved from journalism into technical writing, no longer writing about people, but about machines and their software. Even though my bank account grew, my soul shriveled in grey cubicles; by comparison, noisy news rooms didn’t seem so bad. The trio I met that day in May 36 years ago published two novels and a non-fiction book as Monica Highland. Lisa See is a successful novelist. In the following years, I ran into Carolyn a few times at readings. I read almost everything she wrote, cried over her tribute to John when he died in 2000, her grappling with grief while sitting in The Self-Realization Fellowship Lake Shrine in Pacific Palisades. She wrote also about her failing eyesight and I could not imagine an unseeing See. My own writing alternated between floods and droughts and I eagerly grabbed her book, “Making a Literary Life: Advice for Writers and Other Dreamers,” when it appeared in 2002. She recommends writing a thousand words a day and “charming notes” of appreciation five days a week to other writers, journalists, artists. I was too lacking in confidence to follow her charming note advice, especially during drought seasons. But I had a list started, and she was the first one on it. So I’m writing it now, my thank you letter to Carolyn. I’m sorry I waited so long.